I only had the best car buying experience with Ari Imanraharji, even though this was my first time purchasing a car Ari was very patient with my family & I. He gave us enough space and also gave really good advice. My parents never had this good of an experience when buying cars. If it wasn’t for Ari I don’t think I would have bought the new 2019 Honda Civic. All thanks to Ari, I would definitely recommend him to friends and family.. without a doubt I would love to make business with him. Had a great experience. Very professional, smooth process. We worked with Steven Lee Creech and he did a great job. We would recommend this dealership to friends and family. I had a recall on my airbag, so I came to get it replaced. They finished quickly, and were extremely efficient and courteous. I found myself in the market for a new (used) car after my trusty 03 Honda Odyssey finally died. Big Star was one of the first dealerships I visited, and although I didn't buy from them that first evening, I was impressed by their selection, prices, and courtesy. The salesman I dealt with was Lee, and he was helpful without being pushy. I visited a couple of other dealerships, and eventually that evening settled on a car from another dealership. To make a long story short, there were some issues with the other dealership trying to rip me off (rhymes with Clear Lake Yissan) and I returned the car that I thought I was buying and took my business back to Big Star. Two hours later I drive away in a great 2017 Hyundai Elantra that they made me a fantastic deal on. 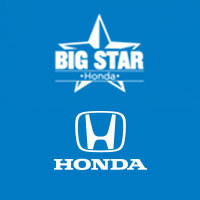 This was two months ago, and I'm still happy with my decision to go to Big Star Honda and Lee for my car purchase. Mannn this place is freakin awesome!!! So I came in with the idea of getting a used but we'll condition vehicle (preferably a KIA sport or Nissan Rogue). But had troubles with credit, thought it was over till Jose Merdado (great guy, hella awesome nd highly recommend as a sales person) helped me out, after being the first one to greet me. The car I'm about to drive off the lot wasn't my choice but all I can think about is how God is working his magic: not the car I wanted but it's a car, didn't have insurance but got on board, nd not having to wake up two hours for work nd dealing with metro anymore. Blessings after blessings nd the rest of the staff are super fast as Jose was nd super excited nd just awesome all around!!! Definitely will come back her nd recommend this dealership to anyone. Thanks everyone, you guys rock nd Jose Merdado again thank you for your service!!! !